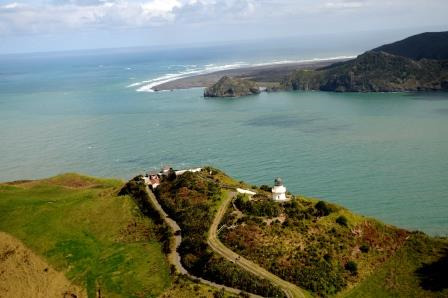 Manukau Heads Lighthouse is located atop Awhitu Peninsula on the south side of the Manukau Heads. Gates are open 9am to 5pm daily and entry is by donation. This lighthouse is one of few visitor-accessible lighthouses in New Zealand. Take the Southern motorway towards Hamilton. Take the Drury off-ramp and turn right. Follow signs to Waiuku. From there it is 45 minutes drive on sealed roads following signs to Manukau Heads and Lighthouse. Turn left at Bombay Hills turn-off and follow signs to Pukekohe and thence to Waiuku. Follow signage from Waiuku as above. Spacious grounds, fascinating lighthouse and stunning views make for a perfect day out. Toilets provided but no drinking water. Portable BBQ’s permitted. No open fires allowed.